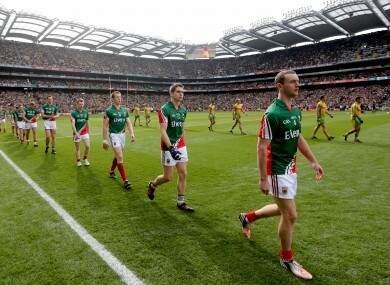 Donegal’s win over Mayo was the only show in town yesterday, RTÉ have revealed. The teams parade before the game yesterday. CROKE PARK WAS full of thousands of Gaelic football fans as Donegal won their second All-Ireland SFC title yesterday. But the rest of us were happy enough to watch in front of the telly as Mayo came up short once again. RTÉ have announced that almost 1.4 million viewers tuned in to the action from Jones’ Rd. Those online also tuned in with 43,000 streams launched within the island of Ireland. Email “Box office: 1.4 million of us tuned in to the All-Ireland football final yesterday ”. Feedback on “Box office: 1.4 million of us tuned in to the All-Ireland football final yesterday ”.